$1 Billion Reasons You Can’t Always Get What You Want. $1 billion–it sounds like a lot, doesn’t it? But, we have a problem: fundraising technology demand (in the form of fundraisers’ expectations) is much greater than fundraising technology supply (in the form of vendor offerings). Put another way, our industry’s annual $1 billion fundraising technology budget doesn’t get us what we want. Cannon Estimates our Industry Spends Around $1 Billion a Year on Tech, Which Isn’t Enough. This demand derives from consumer experience. On our way to work, we all have computers in our pockets and access to billions of dollars of free technology, software and online experiences from the likes of Facebook, Amazon, and Google. Then, we clock in, boot up, and, voila…1997 is delivered by our 6-year old computers. We suffer from what I call the iPhone problem: we want work resources based on our consumer experiences, but these are far too expensive to replicate given our fundraising technology market and budgets. It’s relative deprivation at a high, costly level. It results in wasteful workarounds, decentralized data and systems, and dissatisfied end users. And, in the end, these things keep us from raising more money. Why are we in this predicament? The short answer is there is not enough incentive to supply great fundraising technology that matches consumers’ expectations. Why don’t we have enough incentive? That part is a little more complicated. One might charge (as I did in February) that our industry is hamstrung by narrow thinking around investment. Another might suggest that, while the industry appears quite large, it is unsophisticated and relatively immature. A third might notice that our industry isn’t really large enough as a market sector to warrant the kinds of innovation our colleague-consumers would like. All of these observations inform the infographic above, which depicts the problem: we are typically a $300 billion industry per annum that can only spend about $1 billion on technology each year. 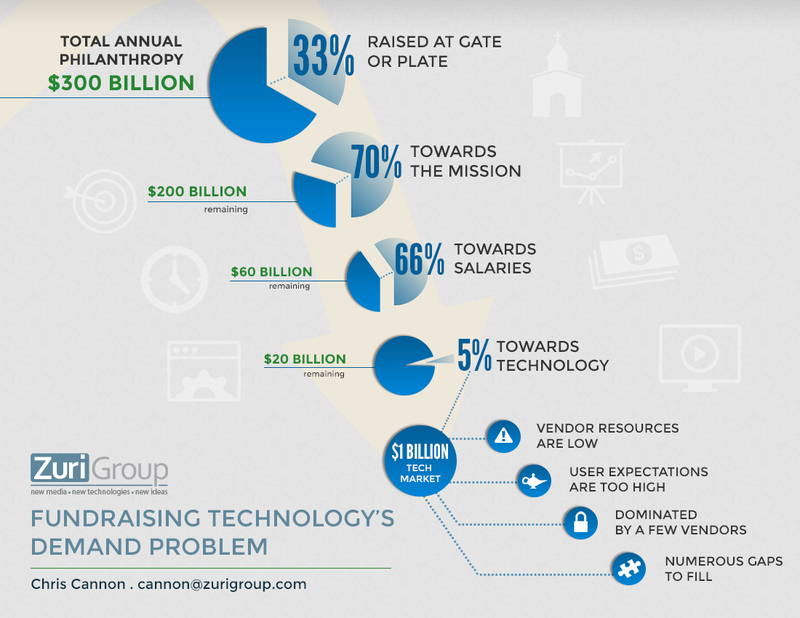 When we consider how much fundraising is done without the benefit of technology (referred to here as “plate and gate” efforts that reflect more grassroots, manual efforts prevalent in certain religious organizations and new and smaller nonprofits), then calculate what we get to spend, then determine where we get to spend it, the market just isn’t that big because our budgets are so small. Note that even a very strong 2014 is likely to bump up available dollars by around $250 million…$1.25 billion is better but still not enough. Of course, there are some exceptions. Leading software providers do their best and it is, frankly, often good enough. I’ve helped organizations leverage nearly every fundraising system and they are all passable. These systems collect addresses, store gifts, provide institutional memory, and support programs. Are they efficient and user friendly? Not particularly. Are their add-ons, such as reporting tools and online functionality, what we’d like? Not usually. But, behavior and poor user adoption are often bigger problems than the technology itself. The issue is not with the core functionality supplied by the market; these tools do what is “necessary”. However, they tend not to deliver on what we define as “neat”. What’s “neat” is shaped by what Apple, Google, and a bunch of other billion dollar corporations bring to the market. It feels like we are destined to have a large gap between demand and supply. Manage expectations. You need to persuade your users that you don’t get to invest like a Silicon Valley start-up, so the tools are a little less nifty. But, they still (should!) work. Convince team members that what you have supports their programs or make commitments to better align what you have with current needs. Illustrate value. Where you see a gap in programs or productivity because of a lack of functionality, quantify the real and opportunity costs. Are donors failing to complete online transactions because of poorly designed forms? Are reports re-worked in Excel at the cost of hundreds of hours a year that could be focused on new donations? Show how the gap deserves to be filled with better technology. Do-It-Yourself. Out-of-the-box solutions will solve some needs, but not all. You may need to partner with specialists and experts to address an opportunity that vanilla systems can’t handle. The market for innovative solutions in between and beyond core systems functions may be in reach, but the same vendor that delivered the vanilla solution may not be able to deliver the customizations you need. Our industry is trapped in a Catch-22: to get funds, we need appropriate technology, but we can’t get the technology we need without these funds. Or, more simply: $1 billion isn’t enough. The fact remains that many of us will have to make the most of what the market has to offer. Those of you with means and vision to implement more custom solutions will likely need to create your own solution when expectations are high and ROI is clear.